The design is based on commercial antennas that are used for FM radio broadcasting in the 88-108MHz frequency range. Note that the antenna is quite compact in size when scaled to 50MHz. 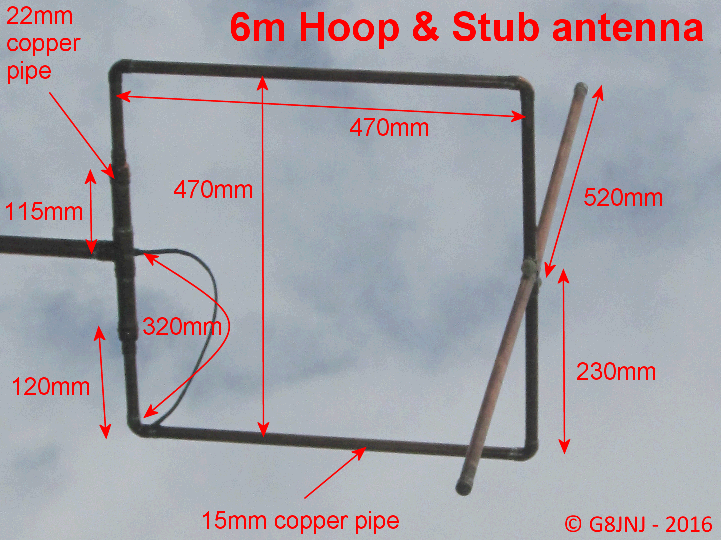 The antenna is constructed from standard 15mm & 22mm UK copper waterpipe and fittings, which have been soldered together. The coax is fed through a 1.4m length of 22mm copper water pipe which forms the boom and which also acts as a 1/4 wave coaxial sleeve Balun. The inside of the boom is strengthened with a length of plastic cable conduit which is a tight fit inside the 2mm copper pipe. To further improve the antenna balance, I also added three ferrite tubes on the coax inside the boom near the feed point. The outer of the coax is soldered to the pipe at the mid point of the loop, and the inner of the cable extends out from this point to form a 320mm long gamma match. Here's a picture taken from the ground below the antenna, showing the various dimensions. 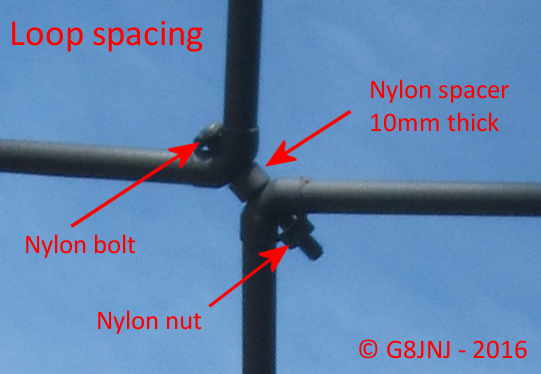 The antenna can be fine tuned by adjusting the thickness of the spacer between the two vertical sections. 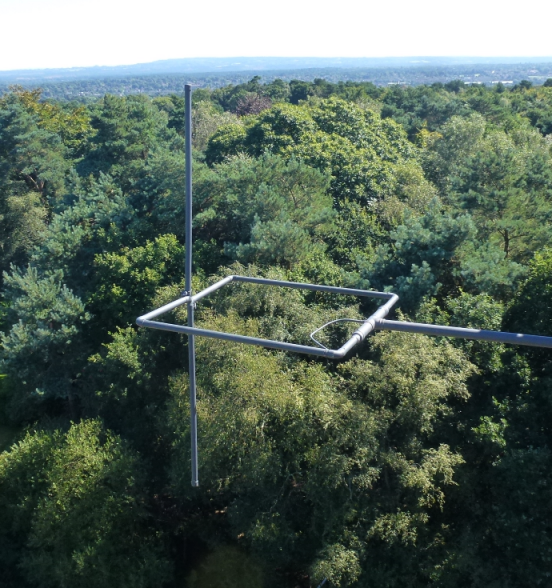 Here's another picture of the completed antenna as installed at the Farnham WEB SDR site. Note that the operational bandwidth of the antenna is quite narrow. The Horizontal and Vertical gain is quite well matched. 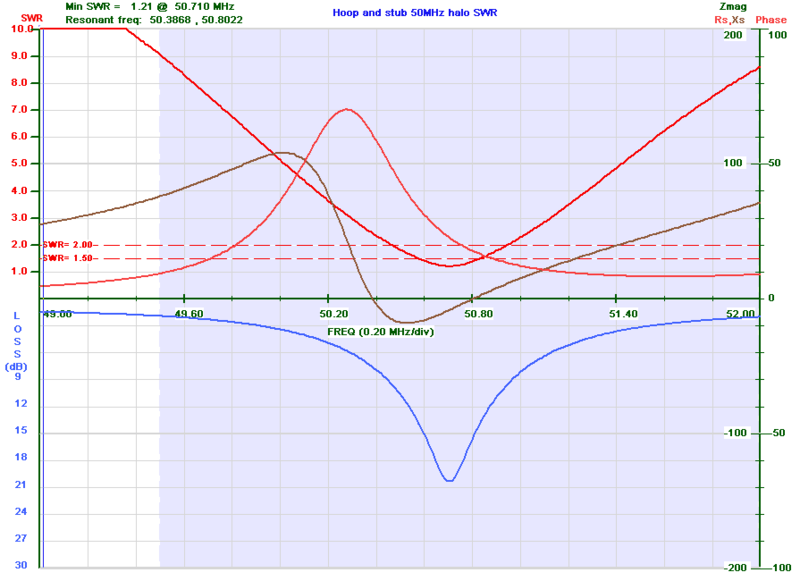 Here's a plot taken on an outside test range. Ignore the absolute values shown on the dB axis. 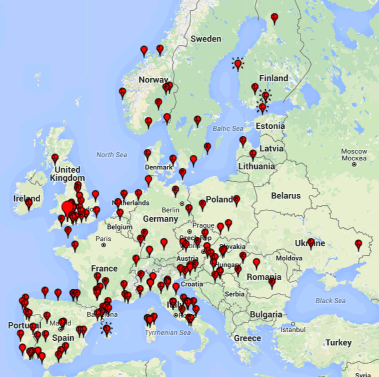 When using this antenna with JT65 on 6m, it produced about 30% more spots in the same 24 hour time frame, in comparison to a another receiver connected to a 1/4 wave vertical (V-2000) mounted at approximately the same height.